Apple just introduced a new 9.7-inch iPad at a special event in Chicago, but the company put an intense focus on its use in education and schools. We extracted highlights from the presentation that matter most to consumers like you. Though Apple is gearing its new iPad offering toward the education market, the tablet is also very much a consumer device. Priced at $329, the new iPad carries over a number of features from last year's 9.7-inch model, including a non-laminated display, an 8-megapixel camera with 1080p video and a FaceTime HD camera out front. However, Apple managed to build in a few additions that make it a worthy follow-up to its predecessor. Most notable are an A10 Fusion processor and Apple Pencil support, the latter of which requires a special capacitive sensing layer in the device's screen. Just like its bigger iPad Pro siblings, the new iPad lets users draw or write with pressure and tilt sensitivity, though the accompanying Apple Pencil will set buyers back another $99. A Wi-Fi + Cellular model with the same 32-gigabyte storage capacity will cost $459, while a 128-gigabyte variants cost $429 for the Wi-Fi version and $559 with cellular. Apple debuted a slate of app upgrades and new software titles to go along with the new iPad. 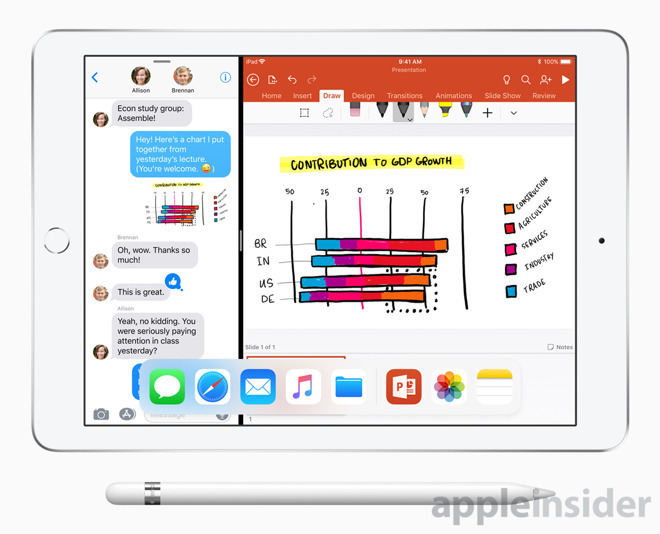 Improvements to the iWork suite now incorporate Apple Pencil support, as does the all new Digital Books app. Clips and GarageBand were also updated with value-added content and, for GarageBand, facial controls via iPhone X and its TrueDepth camera. The new iPad is available to order today in a choice of silver, space gray, and gold finishes, and is expected for delivery later this week. Apple authorized reseller B&H is also accepting pre-orders for the 2018 iPad line with no tax collected in most states.